GERMAN CHANCELLOR ANGELA Merkel has called for the foundation of a European army in future, in what appeared to be a rebuke to US President Donald Trump. Addressing MEPs on her vision for the future of Europe in Strasbourg, Merkel also called for a European Security Council to centralise defence and security policy on the continent. Her calls came as Trump mocked French President Emmanuel Macron for suggesting the creation of a European army, which Washington fears could eclipse the NATO alliance. 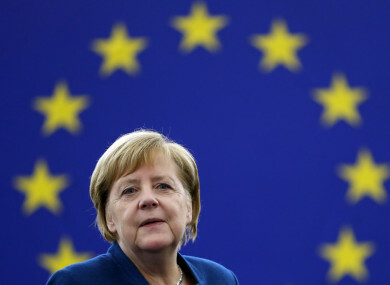 “What is really important, if we look at the developments of the past year, is that we have to work on a vision of one day creating a real, true European army,” Merkel told a session of European Parliament, drawing applause and some boos. Merkel added that the proposal could run in parallel to a trans-Atlantic cooperation within the NATO military alliance, but warned that “only a stronger Europe is going to defend Europe”. “Europe must take our fate into our own hands if we want to protect our community,” she said. The German Chancellor proposed the creation of a European Security Council with a rotating presidency, something she first suggested last summer but which failed to gain traction. On Sunday, European Commission President Jean-Claude Juncker said that any European army “will have to align with NATO forces” and not be in opposition to or in competition with US forces. Merkel’s ambition for Europe came just days after she announced she would stand down after her term in office in 2021, weakened in Germany by her migrant policy. In 2015, Merkel kept open German borders to a mass influx of refugees, drawing the ire of EU partners in eastern Europe who refused to follow suit. In her speech, Merkel indirectly defended her policy. “Tolerance is the soul of Europe that is an essential component of what makes us Europeans,” she said. On Brexit, Merkel called Britain’s departure from the EU “a deep wound” as she thanked EU chief negotiator Michel Barnier, in attendance in Strasbourg. “We are all realising that it is ever more difficult to find a balanced outcome,” she said. Email “'Europe must take our fate into our own hands': Angela Merkel calls for future creation of European army”. Feedback on “'Europe must take our fate into our own hands': Angela Merkel calls for future creation of European army”.